Hopeful Hearts Ministry is a Christian faith-based advocacy non-profit organization (501 c3) giving a VOICE to survivors of abuse. Hopeful Hearts Ministry Headquarters – 1210 Hamblen Rd Suite 875 Please call 281-608-7544 or email hopefulhearts333@gmail.com to set an appointment *Click here to see a list of the classes that empower and peer support groups available! 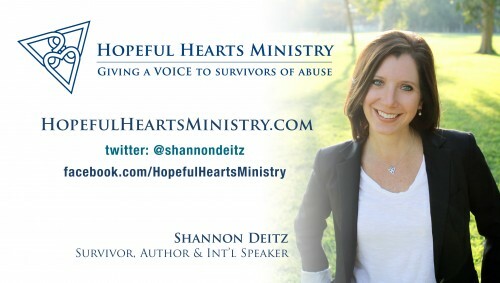 The mission of Hopeful Hearts Ministry is to alleviate the suffering and restore the self worth of survivors of abuse. We are a faith based ministry that supports long-term recovery of survivors through peer support sessions, counseling, and public awareness. Hopeful Hearts Ministry desires to give survivors a VOICE and the number one way we are able to accomplish this task is through peer ministry. Peer ministry consists of one-on-one meetings done in person or via FaceTime or Skype if out of state or country. In peer ministry we encourage life-sharing conversation and offer helpful, emotionally healthy tools such as methods, plans, goals, time lines, and accountability with lots of prayer to use on their healing journey. We do not replace professional counseling and often we will encourage survivors to seek professional therapy depending on where they are in their healing journey. The simple statement is that, through Hopeful Hearts Ministry, Shannon stands as a wonderful companion on the journey of healing from sexual abuse. However, that phrase does not begin to communicate how important that companionship is in my life, and in the lives of so many survivors that she helps. My counselor was not sexually abused and Shannon is able to offer insights and perspective that only come from a survivor. She does not step into the role of my clinical counselor but dovetails what we talk about and helps me process and apply it. She is able to navigate a difficult path with me, and she shares in the hurt, fear, and frustration that go along with a history of abuse. As I have not talked about my experiences with many people, much less details with really anyone but my counselor and Shannon, through Hopeful Hearts Shannon has walked this road with me when, otherwise, I would walk it alone. She stands as someone who has already been down this road, and at the same time, since we’re both survivors, we walk it together. I have an amazing counselor who is helping me begin to heal, but Shannon has honestly enriched the process. She has added the hope, understanding, support, strength, clarity, warmth, and love of a cherished friend. Shannon Deitz, author of the award-winning book, Exposed: Inexcusable Me…Irreplaceable Him, is a frequent speaker at churches, conferences, schools, fund raisers and women, young adult and teen retreats. Host Shannon at your next event and join her in reaching out to those in need of her life-changing message of hope. Both charitable contributions and income made from paid speaking engagements and book revenue will be used to publish materials and to offer presentations to groups that otherwise wouldn’t be able to afford the resources; such as women’s and men’s penitentiaries, women’s shelters, women’s clinics, teen shelters, etc. Hopeful Hearts Ministry is a brand new entity, formed on January 24, 2012 and is a 501 c3 non-profit organization. All donations are a true blessing and deductible! BUY ONE / GIVE ONE When you buy a Hopeful Hearts Charm we give one to a survivor of abuse.